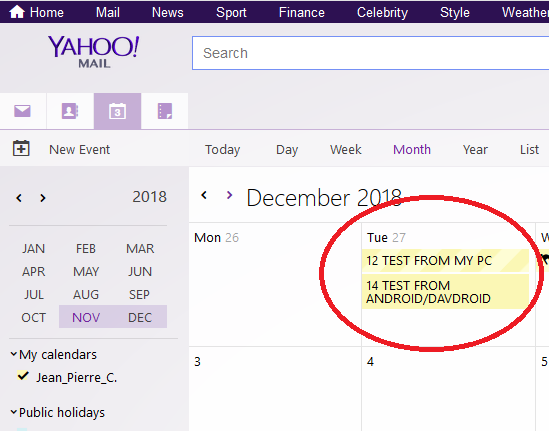 I used “Add account/Login with URL and user name” and entered the URL https://caldav.calendar.yahoo.com and my full Yahoo email address and password. The Yahoo account has “Allow apps that use less secure sign in” enabled. After hitting “Login”, I get “Couldn’t find CalDAV or CardDAV service.” I checked email and password twice, I also tried my Yahoo user name (without @yahoo.com): same result. I searched for an application synchronizing Yahoo Calendar with my mobile calendar, with read/write both ways. I received exactly the same message as Mike, using the same initial procedure. I tried also by using the login/pwd option. Idem. Now, concerning "Yahoo “Account info” / Account security and enable “Allow apps that use less secure sign in”. @jprc I see you have two-step verification activated. 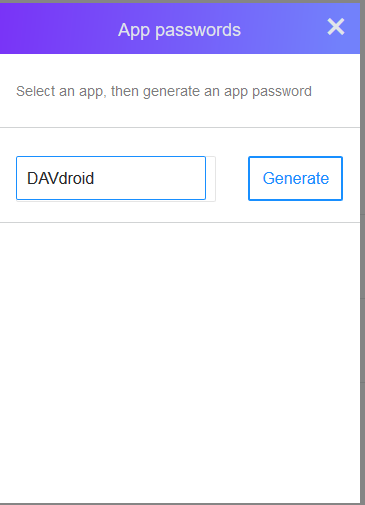 You probably have to generate an app password for DAVdroid and use this password to login with DAVdroid. Does that work? I see… the last option at the bottom ? I never noticed it, or needed it either before today. I will try probably this week-end, and first try understanding how it works (generate a pwd for putting it where?..). I will keep you informed of my tries, success or failure. Thank you very much for your inputs! I have now updated https://www.davdroid.com/tested-with/yahoo-mail/ for two-step verification. Can you give it a try and tell me whether it works for you? In short : IT WORKS !!! This step-by-step is for any one using a two-step verification for your Yahoo Account security. Your Yahoo Account Security shows your current status. 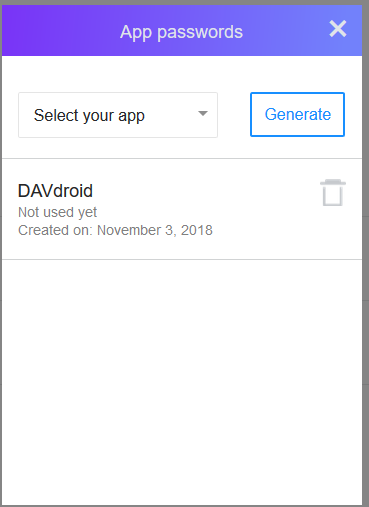 It indicates in my case that the 2-step is activated: you will need then to generate a special password that ONLY DAVdroid will be allowed to use. 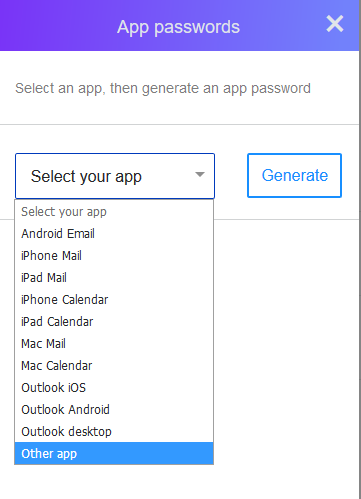 When you click on “Generate app password”, a pop will ask you to select your app. … then type a name. 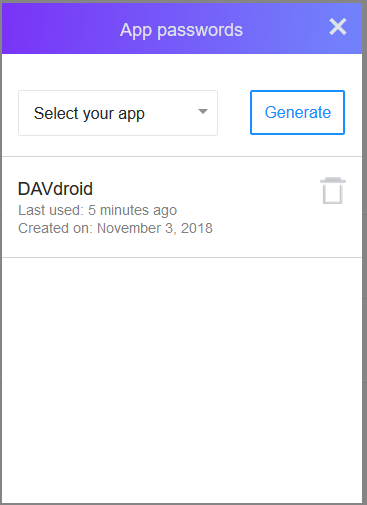 For easily remembering, I simply type “DAVdroid” (but it is up to you, it does not matter as it is only for your eyes). A password is generated by the system. Here, it is “aaaa bbbb cccc dddd”. Beware, you can have spaces like in the example below (I had). Password must be used with the spaces, exactly as displayed. 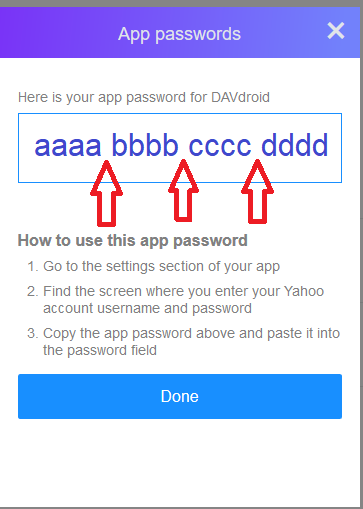 You have instructed Yahoo to keep an eye on ANYTHING that will log in, using this password, and as soon as this login is detected, it will be attached to the application registered with name DAVdroid. Let’s go to the smartphone, install the app if not done yet, and run it for the 1st time. Click the big “+” bottom right. There are 3 options. Choose the classic one : “Login with email address”. Click on “LOGIN” bottom right. DAVdroid creates the account, and checks if your configuration can be an issue to the background synchronizations. I have a Huawei (P20 lite), and it seems some brand can be capricious. Fortunately, the warning were just warnings in my case, and nothing was blocked in the background. But I had, by instance, to authorise my “battery saving mode” to be disabled for this application (there is a message asking the authorization to do so). … I see that it is all set, I can select and activate MyDog’s Calendar , and start the synchronization !!! Back in my Yahoo Account in my PC, I refresh the page and receive the confirmation that the special login (with the generated password) is now linked to my app, and Yahoo has it in its records. Now the final test : I create an event in my PC, and another one in my Android smartphone. Is not it great ? @jprc Thanks for sharing the whole process, including screenshots! I’m happy that it now works for you.